Concurrently on view in the Thinkspace project room are new works by Canadian based artist Keita Morimoto in Tronie. Born in Osaka, Japan, and a recent graduate of OCAD University in Toronto, Canada, Morimoto has explored portraiture in his work, seeking figurative expressions of identity. With an interest in the ways in which a portrait can elevate or erase the subjectivity of the individual, Morimoto engages its historical traditions with technique and formal strategy, creating beautiful works that seem to defy their historical moment. 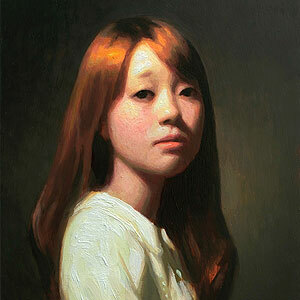 Morimoto’s paintings stage compelling tensions between the historical and the contemporary. Incorporating stylistic elements from old master techniques, and including subtly erroneous inconsistencies and deviations, the artist creates ambiguously timeless pieces that seem to evade historical placement. With a relatively late exposure to the history of western painting, Morimoto was captured by Rembrandt’s portraiture and by the eerily embodied presence of his subjects, an interest that continues to inspire his work and its execution. In Tronie, Morimoto explicitly references the 17th Century history of Dutch painting. Tronie, which is Dutch for “face”, was a type of genre painting; portrait painting intended as a generic study of an anonymous sitter. In keeping with the tradition, Morimoto creates a series of anonymous portraits of his peers and friends, effectively objectifying them and performing an erasure of sorts through their enforced anonymity. Exquisitely rendered, Morimoto’s portraits manage to elevate his contemporary sitters with a strange aura of history, all the while displacing them through a dated genre and context. We are left wondering about their staged anonymity and our own.